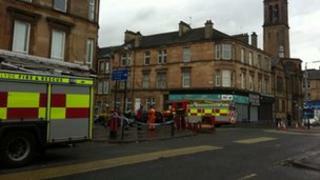 A fire at a Glasgow tenement, which forced three men to jump from a window, is being treated as suspicious. Emergency services were called to the blaze at the flats in Albert Drive, Pollokshields, at about 02:00 GMT on Monday. The three men, aged 32, 60 and 61, who jumped from a window are still in hospital in a stable condition. Another nine people were evacuated - three from the burning tenement and another six from a nearby building. Fire crews said they were faced with chaotic scenes when they arrived, with a fierce fire in the basement and a number of residents shouting for help from their windows in the upper floors as smoke entered from below. Strathclyde Police said occupants of the building, including local businesses, had been unable to return because of the work which was needed to make the building safe. It said its officers had also been unable to thoroughly investigate the cause of the fire because the building was unsafe. The force said there were no descriptions of any suspects and appealed to anyone in or around Albert Drive when the fire broke out to contact officers. Police said they were particularly keen to speak to anyone who may have seen someone hanging around, acting suspiciously or running away from Albert Drive.